The photography world is, without a doubt, a fascinating craft, or even profession to pick up, regardless of our age. But the proper operation of complex cameras such as a DSLR model is not something that is learned and mastered in just a couple of days. As we move into the future, a year after year, smartphones are becoming increasingly widespread. Not just across the world, but also across different ages. Today lots of kids use smartphones and smartphones have the best kids camera. Taking photos and sharing them is more popular than ever, but that’s fine for casual, mobile photography. What if our kids want to learn more about photography and take better quality images, or, if a child is simply too young to play with a smartphone? Be it for entertainment, learning or creativity, there are cameras that are designed for specifically for kids. These are toy cameras that can capture real photos but aren’t very impressive when it comes to image quality. What best kids camera you choose for your child really depends on their age and their interest. Maybe we’re talking about a small child that just wants something to play with, and taking photos is always fun. On the other hand, some kids are advanced and may develop a keen interest in photography. Still, they are kids so we need something relatively simple to use and rugged so it can survive drops and water splashes. Considering the price of professional photography gear, it probably wouldn’t be a wise choice to give them a reflex camera to play with and learn. However, there are kids cameras that, according to the child’s age, will help with their psychomotor development, increasing its capacity for creativity and improving their understanding and abilities to then move on to a more complex model. We have prepared a detailed review of what we consider the Best Kids Cameras out there. We’ve covered everything from a simple toy camera, to a camera that can be taken underwater for snapping vacation photos at the sea, to a simple film-based retro camera that kind print physical photos instantly, to small and compact enthusiast solutions such as the Mirrorless or DSLR cameras with interchangeable lens. Make sure to also check out our FAQ and Criteria selection at the bottom of the article for a better understanding of what type of a camera is best suited for different kids, and how exactly do we choose to recommend a certain camera. You never know, maybe your child has the potential to become an award-winning photographer that will move the world with his or her photos. So, dig in into our comprehensive review list and happy shooting! An age in which “accidents” are prone to happen, and while devices such as smartphones and tablets have contributed to making this age more digital savvy, overexposure to these is not too healthy for them in the long run. Fortunately, there are very colorful digital camera models designed especially for toddlers, with simplified controls, which will help them to understand the magic of photography. A camera designed for that petite photographer who want to take its first steps into this exciting world with overwhelming certainty! When it comes to the choice of digital cameras for kids, a few factors should be considered more and given a little bit of attention. As such, it is important to consider the camera’s ease of use as well as durability if you are to get the right choice. VTech Kidizoom Spin and Smile Camera is one of the many different kid cameras offering a combination of multiple features that you’ll find suitable for your pre-school age kid. It is however worth noting that this camera isn’t perfect but comes with multiple advantages that far outweigh the disadvantages. Let’s look at some of the things that make this camera amazing. The VTech Kidizoom Spin and Smile Camera offer an important factor when it comes to the pre-school age kid cameras; and that is the ease of use. The camera has comprehensive controls making it by far much superior to others in the market. Additionally, the camera has a number of clearly marked buttons and its menus can easily be navigates by the little ones. 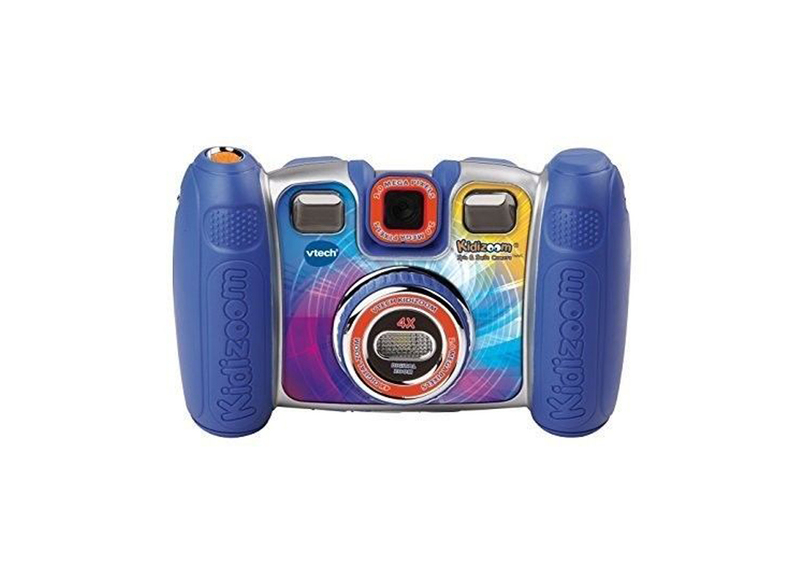 The Spin and Smile Camera from Vtech Kidizoom uses four AA batteries and has an internal memory with a capacity for 350 pictures. The capacity is however lower than usual but you can use a micro-SD to expand the storage since it comes with a slot for that. You expect kids to smash the camera now and then and durability is a very key feature when choosing a digital cam for your kid. The Vtech Kidizoom Spin and Smile comes with covered ports and rubberized bumpers which gives it a great durability rating. The camera does not damage easily when smashed or dropped and different parts including the protruding viewfinder eyecups are always safe because they are rubberized. In addition, the Spin and Smile camera has sturdy side grips on both sides and these can absorb the fall impact very well. It is also good to note that the two ports provided by the camera (USB connection and USB card port) are covered with tightly fitting rubber caps to keep off foreign substance from entering the camera. The performance of Vtech Kidizoom Spin and Smile camera is not only fun to use but also functions very well. It comes with a number of extra games, fun features and options including the feature known as ‘rotating camera’. With this feature, kids can take selfies or shoot normally thus giving them a fun experience. Another great feature in this camera is that is allows kids to add funny effects to their images including overlays capable of turning people into funny characters or distort their faces. The Vtech Kidizoom Spin & Smile Camera doesn’t offer great image quality but this is normal for cameras in this class. With 2 pixel resolution, the camera doesn’t give detailed or large images but still works well for kids. Kid’s digital cameras are not meant for professional photography. 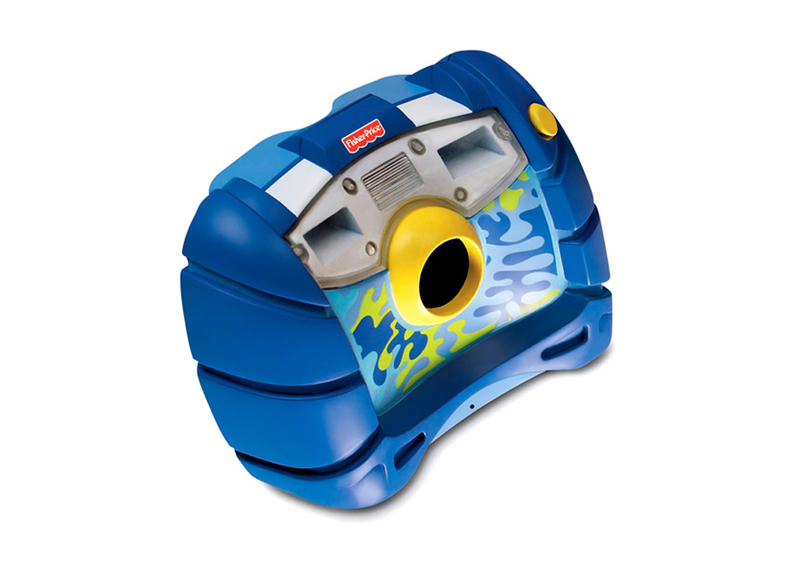 The Vtech Kidizoom Spin and Smile Camera offers quality features meant to make kids’ photography fun and enjoyable. The camera is available at an affordable price and it durable. Worth every penny! If your child feels curious to experience how it feels to work with a professional camera, don't ruin its illusion and allow him/her to enjoy long hours of fun with this nice camera from Hasbro. The Playskool Show Cam is one of the digital cameras that will definitely work well not only for kids but also for grown-ups. Although it is intended for kids, this camera comes with some amazing features which you will find in real digital cams carefully combined with kid-only features which will keep your kids looking forward to a real fun experience. 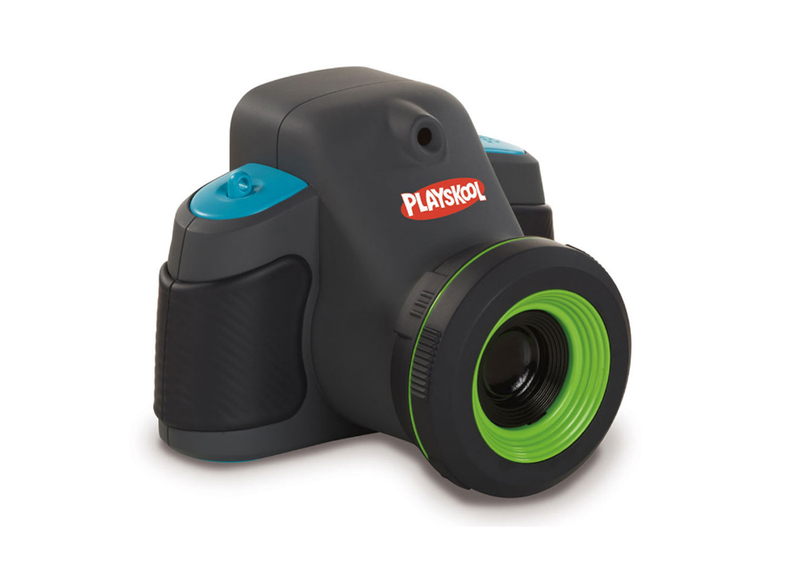 The Playskool Showcam is designed for durability and its picture resolution is perfect for a digital camera of its class. We highly rated Playskool Show Cam when it comes to durability. It’s big and this is something you likely would expect when dealing with a digital camera for kids. It also has comfortable grips on each side thus giving your kid a firm grip when taking those unique shots. The Show Cam is made of heavy plastic and all the necessary components are tucked safely inside. As would be expected, kids’ digital cameras are bound to fall once in a while but the Playskool Show Cam is a tough nut that wouldn’t easily fall apart. The digital camera for kids works with AA alkaline batteries and these can therefore be replaced when necessary meaning you can have back-up option for uninterrupted shooting. You can also save the charge thanks to the auto shut-off feature which comes with this camera. Compared to many other digital cameras for kids, the Show Cam is a step ahead when it comes to storage capacity. Your kid can enjoy a storage capacity of up to 1000 images at any given time. On the other hand, the kids’ digital camera has image resolution of 2 megapixels which makes the images clear when it comes to kids’ photography. It is however important to note that the Playskool Show Cam does not record videos but kids will enjoy the unique playback feature that allows them to create their own slideshows. The kids’ digital camera comes with a view screen that allows your children to view and scroll through the pictures in the camera. It is also possible to transfer images from the Playskool Show Cam using a USB cable and do some sharing with friends, print or editing. Amazingly though, the camera has its own incorporated photo-editing capabilities. Your kids will love the Playskool Show Cam especially when it comes to the addition of photo effects. The digital camera has over 50 creative touches which can be used to add multiple effects to the images including sunglasses and wild hair. Your children can enjoy more creativity by saving and projecting these effects using the camera’s projector. There is no doubt that Playskool Show Cam is a great digital camera for kids. Its pictures are decent and the integrated photo- effects and photo-editing abilities makes for great features for creativity. The photo projector also adds to the magic and your kids will love this sturdy camera. Easy to hold, rather than a camera is a cute toy for children of all ages. 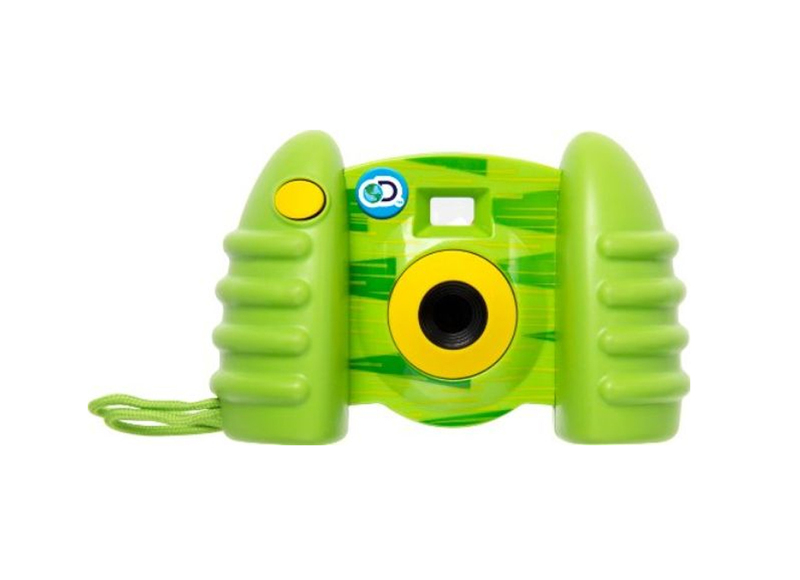 Enjoy to see kids playing to be photographers with this Discovery Kids Digital Camera. If you are looking for the best digital cam to introduce your kid to the wonderful world of photography, then Discovery Kids Digital Camera it a good option to consider. This unique camera is designed for kids and the outer body looks just more like a toy thus making it a great attraction for the little ones. It not only captures some great photographs but also comes with video recording capacity and your kids will fall in love with it. It is however important to note that the Discovery Kids Camera doesn’t have the usual fun games and features that you would expect in such a digital camera especially when you want to keep the little ones engaged. 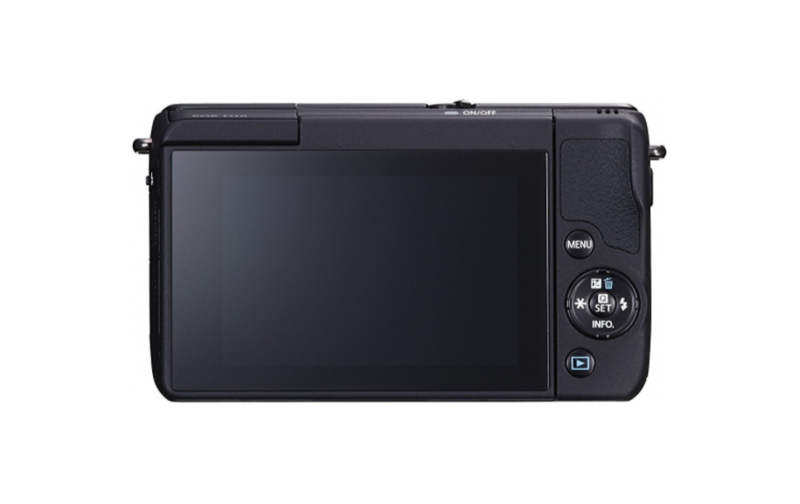 One of the things that you would like about this top rated digital camera is its durable build. The Discovery Kids Digital Camera is made of a sturdy plastic housing which makes it a tough piece and hard to break even when it falls. This is ideal considering that the camera will be in hands that are not too careful and therefore will drop it now and then as they go about the photo adventures. The storage capacity of this digital camera might be unimpressive especially because you are dealing with adventurous kids who would want to keep capturing great shoots. It can store up to 100 images and this comes short of what is normally the average storage capacity for kids’ digital cameras already in the market. Another great feature you will love about the Discovery Kids Digital Camera is the view screen which allows them to see everything they capture without transferring the images to a computer. This coupled with the playback mode makes for a good experience when it comes to the outlining of taken images. Video recording is yet another great feature found in this digital cam for kids. It allows your kids to record silent videos but unfortunately they cannot record them while moving around. This is due to the distortion that is likely to be created when such a thing is done. In addition, the Discovery Kids Digital Camera videos normally cut off when they are played back. Although this could seem unfortunate, it could be impressive to the young minds. We wouldn’t expect a kids’ camera to offer high resolution images but what you get from this camera is definitely low. However, the images will still be impressive to the kids during the early introduction stages. The kids’ camera offers digital zooms which allows for close-up photo capturing. With the USB cable, your little one can easily upload their videos and pictures to the computer. The Discovery Kids Digital Camera does fit well as an introductory photography device for kids. It is simple and fairly priced thus ensuring that your kids will always be thrilled when shooting outdoors. The fact that it can record videos and allow for close-up photo capture makes it great. Truly, this camera is worth the price! The child toy industry giant gives us this model of camera designed to experience photography as similar as possible to a real compact camera. When buying a digital camera for your kid, there is no doubt that you would want something durable and simple. The Fisher Price Kid Tough is as the name denotes and offers a tough body that is capable of withstanding bumps and pressure from playful kids. It is a great camera when you want to introduce your little ones to photography as it offers basic features that will help them learn and do this. However, one of the unfortunate things with this camera is that it lacks basic fun features and games that are designed to keep young ones engaged for long. One of the key benefits of the digital Fisher Price Kid Tough camera is that it is capable of withstanding continuous drops from kids. The digital camera is a tough device capable of playing in the tough league thus giving kids something to experiment with for hours. It weighs up to 14 ounces and works well with little ones up to 3 years of age. The rubber-like material used to construct the body can easily bounce after being dropped from high heights while leaving the camera intact. The Kid Tough digital camera from Fisher Price has two viewfinders thus giving the kids two different options to enjoy when focusing their eyes on a subject. 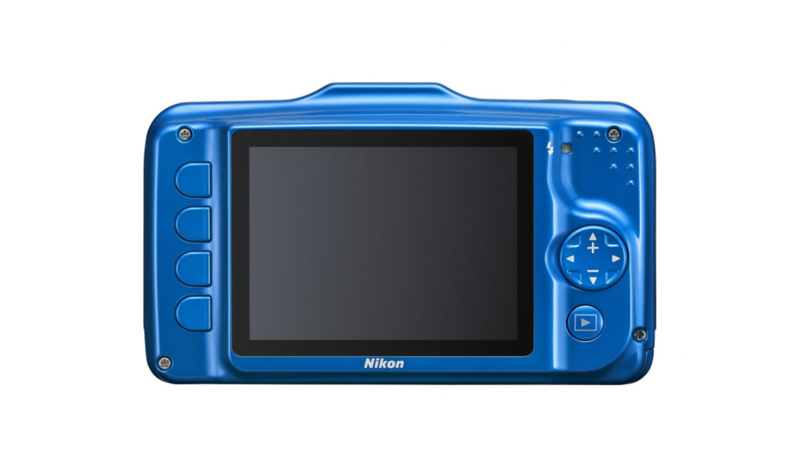 In addition, the digital cam for kids offers a 1.4-inch view screen which your child can use to view the fun pictures they’ve taken throughout the day. Although this camera doesn’t come with a USB cable, you still can invest in one and use it to transfer the captured images to your computer for editing or sharing. 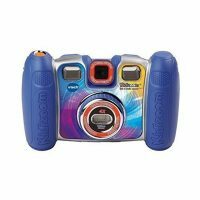 The Fisher Price Kid Tough digital camera has the capacity for you to download special software for kids to add cool photo effects to the images they’ve taken. This also comes with clear and easy-to-understand instructions that will help you do this. With the downloaded software, kids can also edit their images and make them interesting before sharing. Storage capacity is one of the most impressive features offered by the Fisher Price Kid Tough camera. This kids’ digital camera can store up to 2,000 images, thanks to its impressive 64-GB internal storage capacity. There is nothing better for kids than to know they can record all the photos they want without struggling with issues of storage. Kid Tough has zoom buttons which kids can use to zoom in or out for nice close-ups or capture more with each snapshot. The cam also has an automatic flash which adds to the uniqueness of kids’ photography especially when taking images within a distance of 10 feet. The camera uses 4 AAA batteries whose case is secured using screws for safety purposes. The Fisher Price Kid Tough is a good camera to introduce your kids to photography. Its spacious storage capacity makes it impressive while the sturdy build means you do not have to worry about continuous dropping when kids are in action. When many times our children want to play with our Smartphone and we fear for the integrity of the given investment, LeapFrog offers this convenient Phone Case with App for iPhones, so we will convert our phone into a child camera. 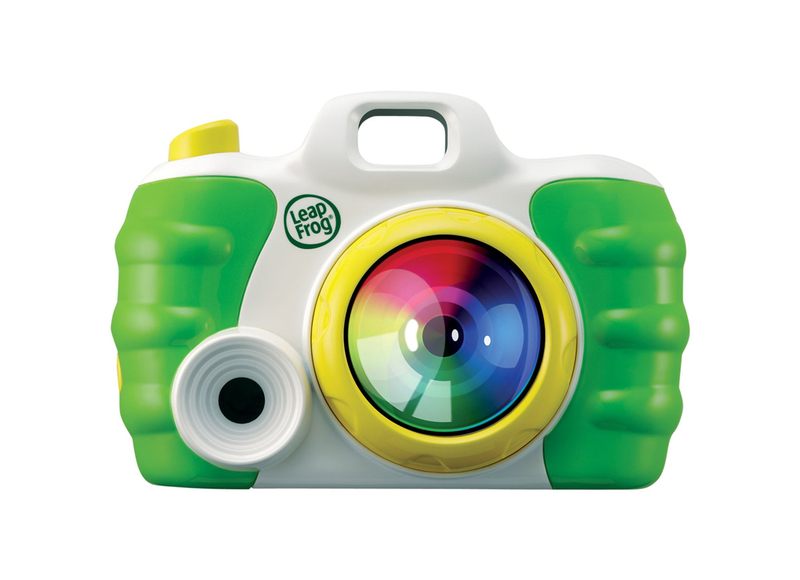 The LeapFrog Creativity Camera is a great investment for kids aged between 3 and 6 years. This amazing digital camera is designed to allow your kids enjoy full-blown creativity as they explore the world of photography on their own. The Creativity Camera from LeapFrog combines the camera power of iPod and iPhone touch to create a fun learning atmosphere for the little ones. It has a protective case and app which are designed to not only keep your iPod and iPhone touch devices but also the stored information. This means that you can allow your curious and creative kids to use your iPhone or iPod for fun and creativity without putting your precious investment and stored data to risk. With that, your kids can enjoy hours of fun using your device when using the downloadable creativity learning app. For the kids to enjoy the LeapFrog Creativity Camera, all you need to do is to download the creativity learning app which is included and then place your iPod or iPhone into the protective case. This will open wide the gates of fun, games and activities for your kids for hours. With the creativity camera, your kids can enjoy the creativity of editing photos to give them a silly look or just decide to create some special photo albums for fun and learning. In addition, the LeapFrog Creativity Camera allows your kids to play thrilling augmented reality games to keep themselves fully engaged. The innovative app simply translates your device into a kids’ camera allowing them to go on a photography mission and edit photos to enhance their creativity. Your kids will not only learn how to record great photos but also stretch their imagination using the images they capture. If you have been having issues with your kids wanting to use your iPod or iPhone for photography, the LeapFrog Creativity Camera will help save you the agony of seeing your phone damaged or information lost. The Creativity Camera offers 6 modes for photo editing plus reality games specially designed for curious minds. It’s good to note that the LeapFrog Creativity Camera doesn’t work alone. However, it provides your kid with a perfect combination of easy to use camera case & app and the high-resolution iPod or iPhone camera. The results can only be perfect photos and fun environment for your kids to grow. The process of setting up the LeapFrog Creativity Camera is very easy. Simply position your iPod or iPhone in the Creativity Camera case to download the available app for your kid to enjoy the fun. The camera allows your kids to have fun and also be creative. With the Creative Camera from LeapFrog, your little kids can express themselves and come up with a little bit of creativity while learning different curriculum-based activities. The LeapFrog Creativity Camera is a unique tool for introducing your kids to the world of photography and creativity. The fact that it can transform your iPod and iPhone into a kids’ camera makes it unique as your children can explore and expand their creativity anywhere, anytime. It might not work for you if you do not have the compatible devices though! Taking a leap over the age gap, we have a few more cameras, this time designed especially for children from 6 years and onwards. by this age, for many, photography stopped being an explorative game which requires constantly stimulated activity and with the child; becoming a real way of looking at life through a lens. We have displayed the following cameras in order, from lowest to the highest degree of complexity. These are really great for working their way up to the point that they’re ready to move on to a more professional type of camera. In all list we cannot miss a Polaroid camera! This Polaroid Instax Mini model, in their Hello Kitty special version, will give us the right choice to begin to introduce our children to the real photography experience. If you are in the market for high quality photography for kids, then you will need to have a look at the Fujifilm Instax Mini Hello Kitty. The instax mini Hello camera bundle allows your little ones to product high quality photos instantly. The most amazing thing is that these photos are unique as they are credit-card sized. This is one of the best kids’ digital cameras in the market in terms of features and quality, plus it is easy to use and very sturdy. One of the most amazing features in the Fujifilm Instax Mini is the brightness adjustment dial which allows your kids to shoot photos anywhere, anytime. Whether it’s under the sky blue skies or in a dimly lit room, this little Mini Hello Kitty will produce amazing results that you will fall in love with. Its high-key mode allows the creative kids to capture softened pictures for a vivid effect. When using the Fujifilm Instax Mini Hello Kitty camera, your child won’t at any given time be limited by the lighting in a place. The automatic electronic flash is designed to make photography in low light areas enjoyable while giving kids great images which they can share with their friends. The camera has a unique shape and attractive colors that will interest your kids and help them love photography even as you venture outdoors with them. There is no better camera to introduce your school age kids to photography than the Fujifilm Instax Mini Hello Kitty. The digital camera has other features that let kids to shoot and share their amazing images with ease. Some of these features include a mirror for perfect selfies anywhere, anytime and a close-up lens. The kids’ digital camera also uses a special fill and has a developing time of approximately 90 seconds which reduces your overall wait for snapping and sharing. You can take instant and colored pictures by simply pressing the shutter button. To operate the camera, one only requires two AA batteries which are replaceable. 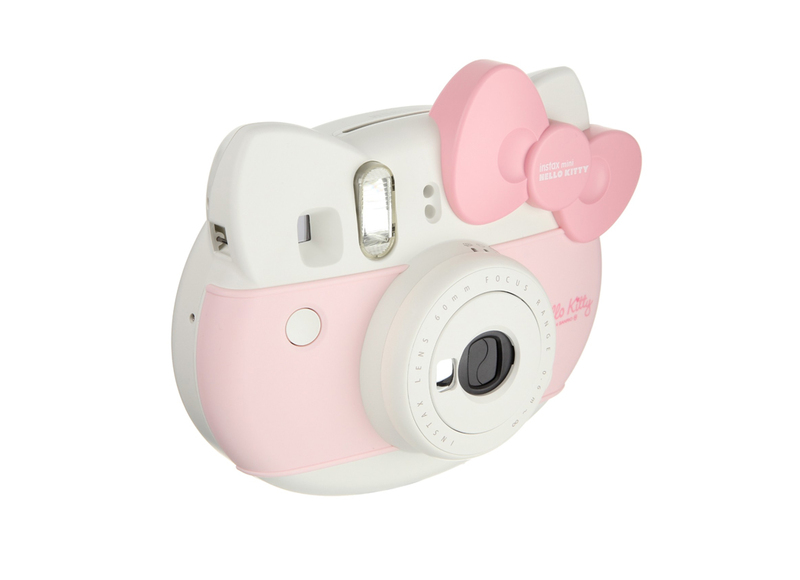 The Fujifilm Instax Mini Hello Kitty is an ideal camera for people who understand retro photography. The instant film camera is compact and easy for your kids to handle and carry with them everywhere they want. There is no need for them to miss any special moments in birthday parties or art projects. Whenever the little ones want to capture instant photos, Fujifilm Mini Hello Kitty will come in handy. Despite the fact that Fujifilm Instax Mini Hello Kitty does not have internal memory for image storage, many kids will find it lovely and fun to use as they are able to produce instant photos. It is a good investment if you do not mind retro photography anywhere, anytime. A real camera for a real photography experience. With this Olympus camera our children can meet the challenge of living photography through their eyes everywhere they go. 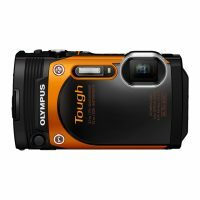 With dozens of kids’ cameras in the market, there is no doubting that the Olympus TG-860 Stylus Tough Camera is one of the greatest among equals. The orange digital camera is versatile, compact and also ultra durable thus making it a perfect companion of kids seeking to venture deeper into photography. This unique camera is an upgrade for the previous version and the Olympus has not disappointed when it comes to the enhancement of its features and functionality. One of the things you might love most about the new TG-860 Stylus Tough Camera from Olympus is that it is durable and offers some unique safety features. To begin with, it allows for deep diving as it is designed to be waterproof for depths up to 50ft, freeze-proof for a range between -10C/+14F, and also capable of maintaining its shockproof capabilities to a drop from 7-feet (2.1 meters). In addition, this gorgeous digital camera for kids has a crushproof capability of up to 220lbf and also features dustproof protection. The Olympus TG-860 Stylus Tough Camera can also operate under temperatures of up to 14°F. In addition to the unique safety features and durability, this amazing digital camera for kids offer built-in GPS and Wi-Fi connectivity which means kids can share the recorded images and videos easily. With an easy to use interface and setup process, the Olympus TG-860 Stylus Tough Camera can be paired with different Android or iOS devices within a few seconds. This is simply done by scanning the devices QR code which is on display in the camera’s LCD screen. 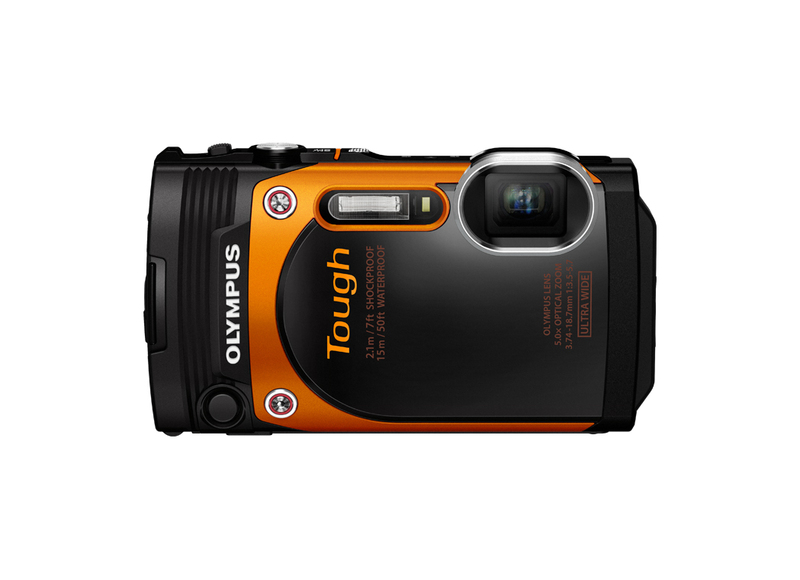 The metal construction on the Olympus Stylus Tough TG-860 makes it a sturdy and durable kid’s camera. This means that your kids can use this digital camera even in unforgiving environments without any fear of damages or breakage. The camera also has CSCH-124 Silicone Jacket that protects it from scratches thus keeping it unscathed always. It is therefore possible to attach the digital camera to a belt or backpack and take photographs hands-free while participating in some of the most extreme actions or sports. Although Olympus TG-860 Stylus Tough Camera is designed for children, you will be amazed at the unique features that it has to offer. Children can record clear videos with the SportCam Mode giving accessibility to four video options. The camera can capture 1080p Full HD videos at 60fps. Additionally, this kids’ cam also has the possibility of capturing 480 60p and 720 60 p. the TG-860 Stylus Tough Camera from Olympus has the capability to record High-Speed movies with different resolutions. Considering that Olympus TG-860 Stylus Tough Camera has a 16MP sensor, your kid will definitely fall in love with the richly detailed and colored images. The fast autofocus capability and low-light performance makes this a unique camera to invest in for your child. Another model of compact camera, in this case by Fuji. Able to withstand extreme conditions, it will prove to be an interesting adventure companion. If you are looking for a “rugged” digital camera for your kids, then you will fall in love with the Fujifilm XP80 FinePix Digital Camera. This camera boasts of some great features and can be used under different environments without being damaged. The Fujifilm XP80 is waterproof to depths reaching 50 feet (15 meters), freeze proof all the way to -10°C and also shockproof from 5.8 feet (1.75 meters). The FinePix digital camera from Fujifilm not only works well for the introduction of your kids to photography but is also an amazing device to help them enhance their skills and creativity. With the digital camera, no adventurous moment ought to be missed as it can used to shoot under different conditions. The unique camera can shoot very clear images thanks to its 16.4 megapixels and a 1/2.3-inch BSI-CMOS sensor. It also comes with a 5x optical zoom that is 28mm at wide angle. If you want your children to perfect their photography skills, the Fujifilm XP80 FinePix Digital Camera will definitely offer what it takes to advance. The digital camera is designed along the same pattern as all the other rugged cameras from Fujifilm. It has rounded, curvy edges and its lens is perfectly encased within the camera thus making it waterproof. It is easy for kids to get their grip on this camera since its front has a ridge where their fingers can rest comfortably when aiming at an object. The Fujifilm XP80 comes with a memory card slot for inserting SD cards for storage purposes. In addition, it has another opening for power cable and battery but all these openings are securely sealed and only release by turning if you want to use the ports. The XP80 FinePix Digital Camera can also be used for video recording. Amazingly, you will like the quality of videos taken using this camera especially when they are recorded from a point-and-shoot. 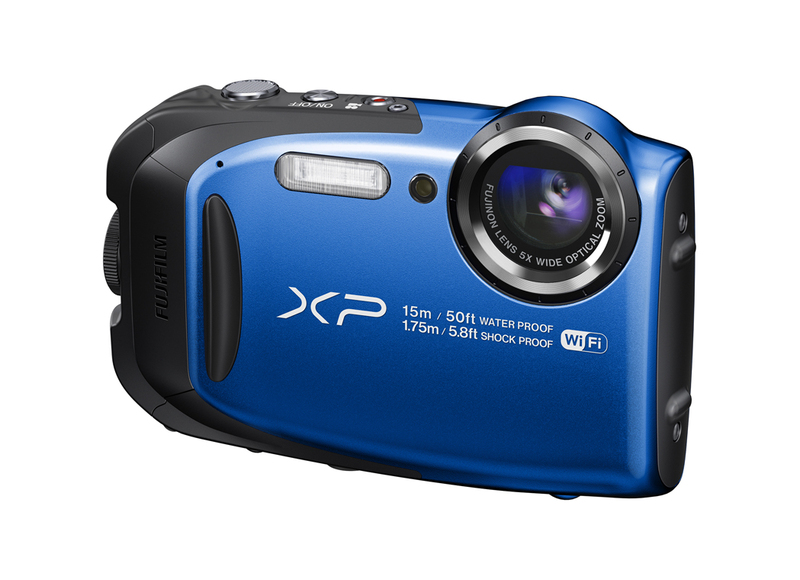 Although the Fujifilm XP80 is not a camcorder, you can shoot some amazing videos in 30 fps. This is however lower than what you get when using advanced cameras capable of shooting in 60 fps. The XP80 Fujifilm Digital Camera has accurate and deep color reproduction mechanism despite the fact that it is a point-and-shoot camera. Just as with other cameras from Fujifilm, it has a number of film recreation modes which you can use to get the colors you want. You will also love the auto white balance accuracy which works well to help you in your shooting. With the XP80 FinePix, you can enjoy Wi-Fi functionality which allows for remote shooting when connected to a tablet or phone. As such, the connected device works as a remote control for your camera thus allowing you to take portraits and selfies. Fujifilm XP80 FinePix Digital Camera is one of the best cameras for kids and the most amazing thing is that it’s cheap. Your kids can enjoy more than 210 shoots per charge and capture all those memorable moments anywhere. 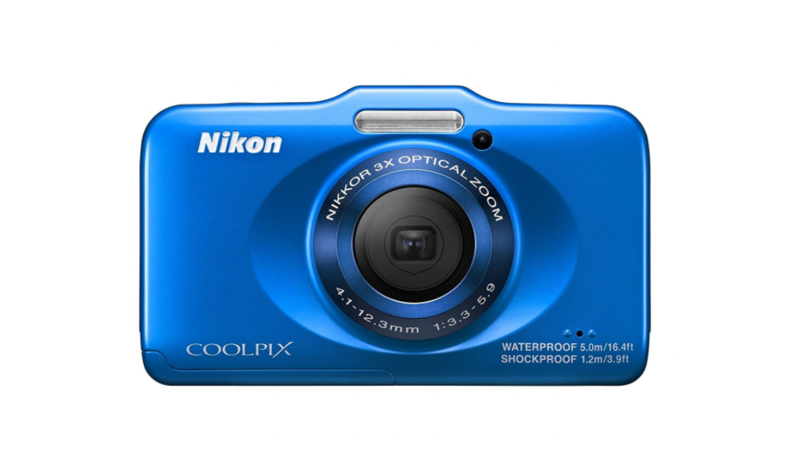 The Nikon Coolpix S31 is a beautiful entry-level point-and-shoot camera with a 10MP CCD sensor. It is designed with simplicity and durability in mind, which is makes it a great choice for kids and family use. This camera comes with in a variety of colors with a modern look and feel. Durability-wise, the S31 is waterproof up to 5m (16.4ft) and shockproof up to 1.2m (3.9ft). This means you can use it underwater, in the rain, drop it from waist height and it will survive all of it. We've mentioned a variety of colors; these include blue, brown, pink, white and the special Beatles Submarine Yellow which is also our favorite. The S31's size measures at 105 x 65 x 42 mm (4.13 x 2.56 x 1.65 inch) and weights 185g. This numbers show us the S31 is more than a toy, and is in fact a solid entry-level camera. The front and top of the camera holds few key elements which are placed symmetrically, hinting again at the simple design of this camera. The front is populated with a large external protective glass in the center, and inside is the 3x optical zoom (29mm - 87mm equiv. focal length) Nikkor lens, which extends and retracts as needed, within the protective glass. This is the key example of what provides water-resistance in this camera, while still enabling for such flexibility that is variable focal length. At the top, you will find a total of three buttons, all of which are larger than usual in order to ensure maximum ease of use. While holding the camera in a shooting position, on the right there is a main shutter button for snapping photos and an On/Off switch button next to it. On the far-right side of the top plate you will find a dedicated video recording button which is marked with a red dot accordingly. Looking at the rear of the Coolpix S31, there is 2.7-inch screen used for taking photos and recording videos in live view, as well as for reviewing the media gallery. Left of the screen you will find four unmarked buttons. These are used in conjunction with the screen – once pressed, the screen will show the corresponding button icon. To the right of the screen there are just two elements – a four-way navigation/zoom controller, and a dedicated media button. Apart from the 3x optical zoom, there is also an option of additional 4x digital zoom. The 10MP sensor means you won't get a whole lot of details, but on the other hand less pixels also means less noise. The photos produced by the S31 should be satisfactory for kids and family group photos, sunny landscapes and interesting underwater shots. Most of the time you will get clear and colorful pictures, just don't expect too much sharpness and fine details. 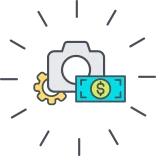 For those who would like a bit more control over their photos, there are several dedicated shooting mods, such as for Macro, Underwater, Portrait, etc. There are also a number of fun and playful digital filters you can apply to your photos. Video can be recorded at 720p HD resolution at 30fps, but not 1080p full HD. 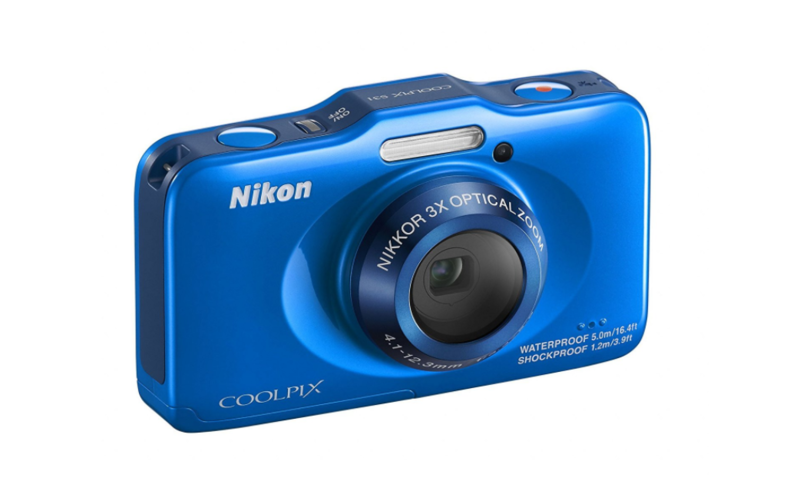 To conclude, the Nikon Coolpix S31 is an affordable, playful, but also capable camera that is designed for ease of use. This means that it is suitable for the whole family, be they kids or grandparents. The image quality is nothing to admire, but it will do a good job for simple vacation and underwater photography. If used during sunny days, as is expected, you will most likely be very pleased with the results. It also features a very durable body which resists water, drops, freeze and dust. 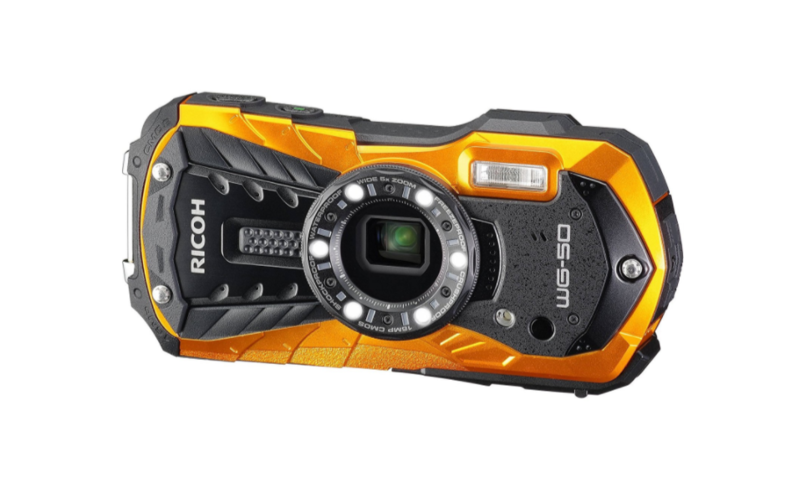 The Ricoh WG-50 is a stylish waterproof camera that is a successor to the Ricoh WG-30 which was released in 2014. The reason we choose this camera over other waterproof cameras is its design. It’s a real action figure among cameras and that’s why boys from age 7 and up will probably find it very attractive. It offers more than looks though. The rugged body can handle underwater usage down to 14m (46ft) of depth, it can be dropped from a height of up to 1.6m (5.2ft) while absorbing the shock. 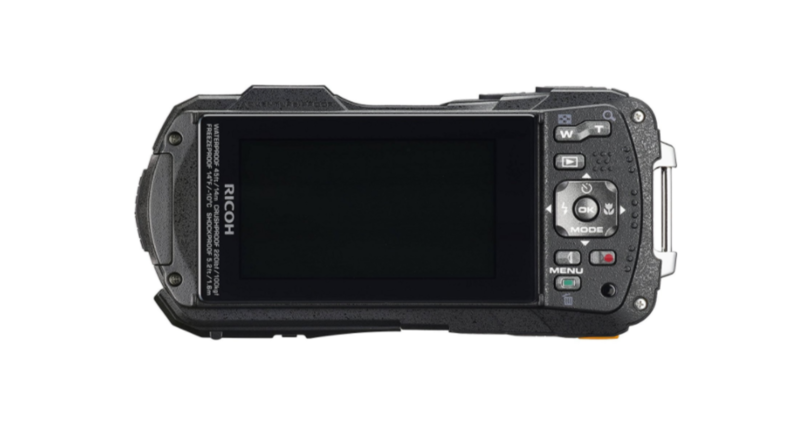 The Ricoh WG-50 is also rated as freeze-proof (-10C/14f), crush-proof (100kgf/220 pounds) and dustproof. On the imaging side it comes with a 16MP CMOS sensor and wide-angle lens with 5x optical zoom. The WG-50 is small and light, perfectly suitable to fit in any pocket. It measures 123 x 62 x 30 mm (4.84 x 2.44 x 1.18”) and weighs 193g (6.81 oz). The whole body is heavily corrugated and texturized, so it does provide an excellent grip with little or no chance of it accidentally slipping through your hands. The camera features a basic set of dedicated buttons. There’s a Power button and a Shutter release button on the top plate. The rear of the camera hosts a bit more than that: A zoom rocker at the top, along with a Media/Gallery button. Beneath is a standard four-way controller for navigation through media and settings, with each of the buttons having a secondary functionality for Timer, Flash, Macro and Shooting modes. Moving further down below, there is a MENU button and a dedicated movie recording button marked with a red circle. What is left is the Delete/Trash button at the bottom. The screen is a 2.7” LCD with 230k dots resolution. It’s not particularly sharp but it does feature extended visibility capabilities for viewing under direct sunlight, using the Outdoor View Settings. To be honest, we would take improved outdoor visibility over extra sharpness for this type of camera any day. The 16MP 1/ 2.3-inch sensor offers good image quality. Still, keep in mind that this is not a particularly large sensor, thus the noise performance at higher ISO might be slightly problematic. Then again, we couldn’t really expect a large sensor to fit in this body and price range. And with 5x Optical Zoom, it’s lens translate to 28mm – 140mm of focal length. It’s a nice focal range that would satisfy a wide range of shooting scenarios. What really impresses though is the 1cm (0.4 inch) minimum focus distance. This makes the Ricoh WG-50 a great choice for Macro photography as well. The Macro mode is assisted by 5 LED lights that are situated around the front lens and simply light up when needed. This is useful for making sure the close-up subjects are properly lit, but it also adds to the cool factor of this camera. Performance in terms of startup time and image capture is impressive. The camera is responsive throughout the interface and it can capture 8 frames per second in continuous shooting mode. While it is somewhat conservative in terms of manual physical controls, it more than makes up for it with on-screen customization options. You will get 24 different shooting modes, including some special ones such as Smile Capture, Self Portrait Assist (Selfie mode) and Pet detection. Certainly some interesting options are here for both kids and adults. There also 24 digital filter effects to make your photos fun and interesting. The Ricoh WG-50 is an extremely versatile and capable camera that does what it’s supposed to do and then some more. You get a solid quality sensor and lens that can take wide angle group photos, landscapes, but can also offer a decent zoom. On top of that the lens can also take extremely close up Macros. The robust rugged body can take any beating and any situation, including diving down to 14m of depth. This is a perfect camera for boys who are a bit older and interested in photography, but it will also do a good job for enthusiast parents and other family members. And taking one last jump to the next age group, we have cameras designed specifically for teenagers. Here we have a wide variety of products, depending on how much money you want to spend, and what the objective is that we are trying to achieve for our young photographers. The following selections follow the criteria which we have evaluated previously above; although we will not find too many noticeable differences in the last two cases. Our final option for Underwater, Tough-resistant camera, ideal for teenagers who desire to have an active lifestyle. The Panasonic DMC-TS30A LUMIX Active Lifestyle Tough Camera is one of the newest additions to the world of quality cameras with quality performance and durability. Designed for rugged use, this camera is a great companion for travelers and will definitely work perfectly well for kids seeking to explore the world of photography. The Panasonic Lumix series offers user-friendly features which you can enjoy as you shoot images that have crisp details. The point-and-shoot camera has numerous automatic functions which you can also take advantage of especially when there is something you want to shoot even when you have no sufficient time to prepare. There are 12 filter effects in the Panasonic DMC-TS30A LUMIX Camera which you can use to enhance your objects before taking the shoots. The sleek digital camera is a great investment for kids who love snorkeling and diving as it offers them an advanced underwater mode and torchlight function. These two features can be used for capturing images below the saltwater and fresh water surfaces down to 26 feet. With the advanced torchlight function, you will be able to illuminate anything within the dark underwater sights thus making it possible to capture stunning videos. With the DMC-TS30A LUMIX Active Lifestyle Tough Camera, you can take photos of 16.1 megapixels maximum. These photos are saved in the JPEG format. On the other hand, videos are also clear and are shot in High Definition and standard resolution at 1280 x 720p and 640 x 480p respectively and recorded clearly in MP4 format. This makes them as compatible as possible. The DMC-TS30A camera from Panasonic has a 16.1 megapixel 1/2.3 inch CCD sensor capable of capturing images of high quality. It offers a high resolution of 230,000 pixels. In addition, you can preview your photos and videos from clear display screen. You can create an impressive time-lapse video using the Panasonic’s Active Lifestyle Tough Camera. By just focusing the digital camera on an object, it will take a series of photos in succession. This works great especially if you wish to automatically shoot timed images frame by frame at given time intervals. You can also capture amazing slow moving scenes such as sunrise or sunset. The Panasonic DMC-TS30A digital camera has a built-in storage capacity of 220MB which can be used as additional storage once the SD card is full. You can store up to 34 images in the internal space. 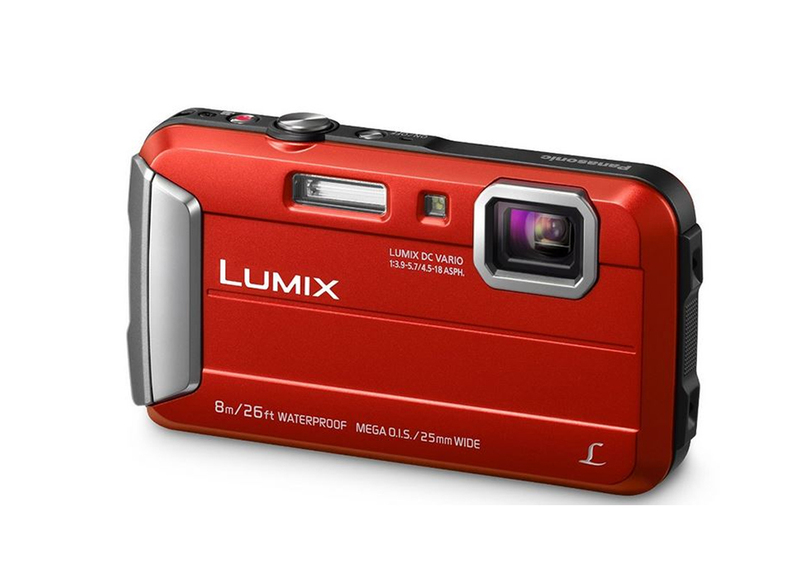 The Panasonic DMC-TS30A LUMIX Active Lifestyle Tough Camera is a great camera for those thrilling adventures. It is a sturdy camera with great capabilities and works well not only for teenagers but also grown-ups looking for a good investment. It is fairly priced and considering it is waterproof, there is more that anyone can do with it. It is a recommended choice for recording those moments you would rather not miss. An ideal choice for those who love technology and social media. A way to redefine photography from what a Smartphone can offer us, but in compact camera version. The Samsung Galaxy Camera 2 is a great digital camera for people who like good outcomes. The camera comes with x21 zoom wide angle lens, 4.8-inch High Definition touch screen and a 16 megapixel sensor (backside illuminated). There is no doubt that every fast-paced teenager and grown up will fall in love with this digital camera from Samsung as it offers larger image sensor and faster lens. Despite the fact that this point-and-shoot camera has a high price tag, everything about it is cool and worth considering especially if you are the kind that loves outdoor adventure. The Galaxy Camera 2 from Samsung is a combination of a gaming device, media player and camera which makes it some kind of 3-in-1 gadget worth buying. But the gaming device and media player aside, let us look at the camera aspect since this is what you are more interested in. The Samsung Galaxy Camera 2 does not disappoint when it comes to photo quality. The camera offers high quality photos which you will be eager to share especially those taken in daylight. It is however worth noting that despite the fact that it has better image processing compared to its predecessor, it doesn’t capture very clear images especially if you want to enlarge or crop them heavily. When these pictures are viewed in full-size, it is easy to notice that they do not have clean fine details, they aren’t soft and there are artifacts and noise at lower sensor sensitivity settings. If you are a pixel peeper, this might not be the best camera for you. The camera’s night mode is amazing and worth taking advantage of especially because it improves color and details and reduces noise by combining different shots into a single photo. The Galaxy Camera 2 has a nice optical image stabilization and good video quality. It is however worth noting that videos can also get noisier and softer if you do not have a lot of light. You can also use the zoom function during movie recording but you will find it a bit rough especially when moving it in and out. The bottom line is that you will find the videos a little bit noisy since even the lens motor does produce some faint noise. However, there is a Quiet Zoom mode which helps dampen the audio when you zoom. You will however love the headphone jack which doubles as a microphone in case you want to do some recording. 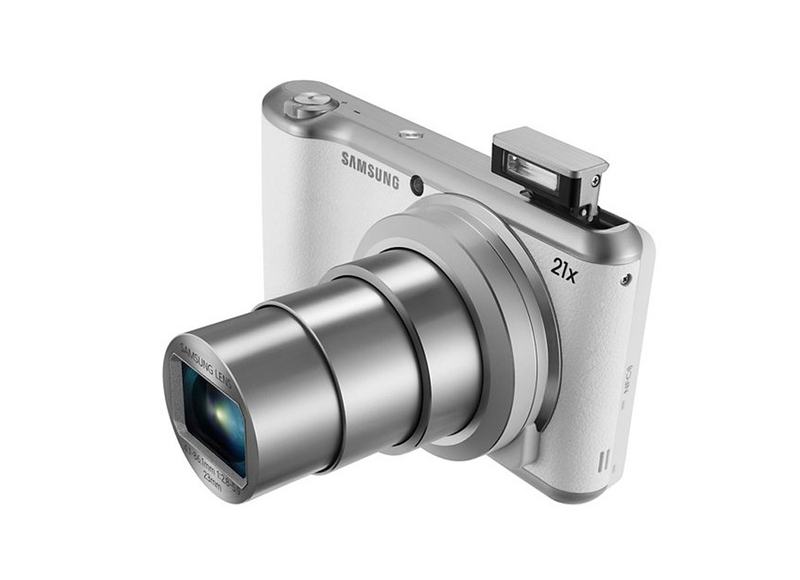 Basically, the Samsung Galaxy Camera 2 has a cool design which you will like. It also offers a 4.8-inch display with 1,280x720-pixel-resolution. This makes it amazing to not only shoot your photos and movies but also when you want to view or edit them. There is no doubt that Samsung Galaxy Camera 2 is a good option for teenagers. However, the quality and sequel do not really match price tag which stands are around $450 - $500. It’s worth considering anyway. Feel the power of a bridge camera with this impressive Sony Cyber-shot with a 24-600mm equivalent F2.4-4 lens and 20MP 1"-type stacked CMOS sensor. There are not many digital cameras in the market capable of overthrowing the Sony Cyber-shot RX10 III from its position as a unique and more advanced bridge camera. To begin with, the third generation of Sony Cyber-shot RX10 camera offers a 24-600mm which is equivalent to F2.4- zoon lens, 4k video recording and 14 frames per second continuous still shooting. This digital camera definitely stands out as an ideal digital camera to buy your teen especially if yours is one of those who crave for sophisticated bridge cameras or devices. The Sony RX10 III has 20-million-pixel and a 1-inch sensor, making it one of the most exciting digital cameras in the market today. The third generation is an upgrade of the previous RX10 models and although the designs are broadly the same, everything else takes a huge leap when it comes to specs and functionality. It is however worth noting that this digital camera is a little bit pricey, heavy as it weighs approximately 1.05 kilograms inclusive of card and battery. The design of the Sony Cyber-Shot RX10 III looks and feels amazing. Holding it in your hands gives you an impression of a camera that is well-made. This is not all, as you hold the digital camera in your hands, you will notice some three control rings innovatively placed around the lens. These are supposed to help in the control of the aperture, focus and zoom. The focus and zoom rings have ridge grips which are almost identical. On the other hand, the Cyber-shot RX10 III from Sony has a superb built-in electronic viewfinder which is detailed and large. It also comes with an exposure compensation adjustment dial. As with all other Sony cameras, the Cyber-shot RX10 III is a little bit difficult to use. The interface isn’t that impressive and its screen is mysteriously not touch sensitive. In addition, the default control design can make this digital camera a bit difficult for users to set an off-center point of focus. However, you can enjoy a pleasant experience with the RX10 III by tweaking the control set up a little bit. The quality of photographs taken using the Sony Cyber-shot RX10 III is not that bad especially when taken at ISO sensitive and variety of zoom settings. The lens does acquit itself well and its image stabilization does a perfect job. 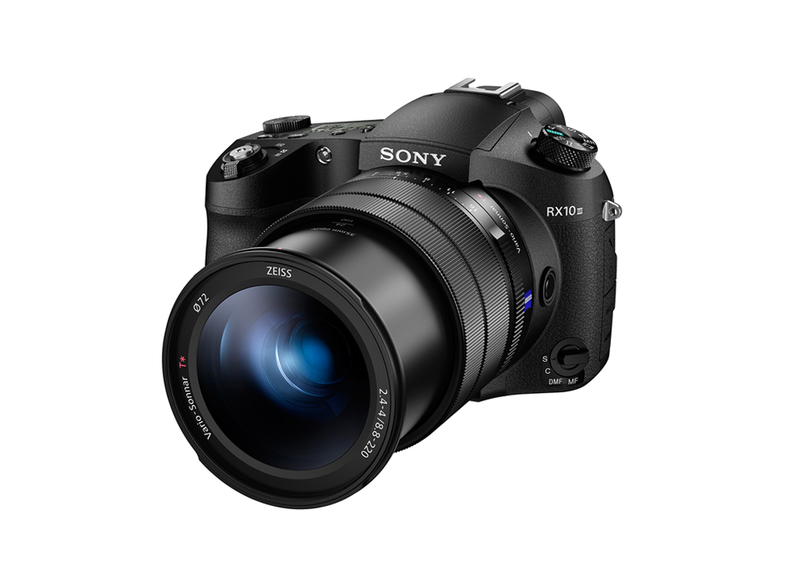 The Cyber-shot RX10 III features a multi-interface hot shoe, built-in EVF, tilting real display and a dedicated EV dial. You can capture slow-motion HD videos and enjoy telephoto photography with the digital camera thanks to the focus hold button which has been added to its lens. The Sony Cyber-shot RX10 III is a perfect digital camera for travelling adventurers. It offers a lot of resourcefulness and without much looking at the price; it truly does make for a great investment to consider. There is no better way for your teenage daughter or son to enjoy the uniqueness of bridge cameras than to get their hands on the Cyber-shot RX10 III from Sony. This camera is one of the best deals out there for entry level DSLR cameras. Intended for auser of 14 years or older because of the complexity of its operation as well as the price point for this camera. The Canon EOS Rebel T6 is not a bad digital camera if you are looking for something to give to your teenage son or daughter as a gift. The point-and-shoot camera comes with a big sensor which guarantees you better quality photos. However, what you might like about this DSLR camera is that you can swap lenses. The EOS Rebel T6 is also a great camera considering that it is compatible with all the Canon EF-S and EF lens system. These include the 60 models that were released recently. What this means is that you can enjoy shooting photos from multiple perspectives ranging from super-telephoto to Fisheye. One of the best things with the Canon Rebel T6 is that it has a ISO of 100-6400 and which can be expanded to 12800. This makes it a great camera for shooting both moving and still objects in multiple lighting conditions. You can shoot during bright sunny days or opt for low light conditions but one this is for sure, you will get some perfect photos under either condition. 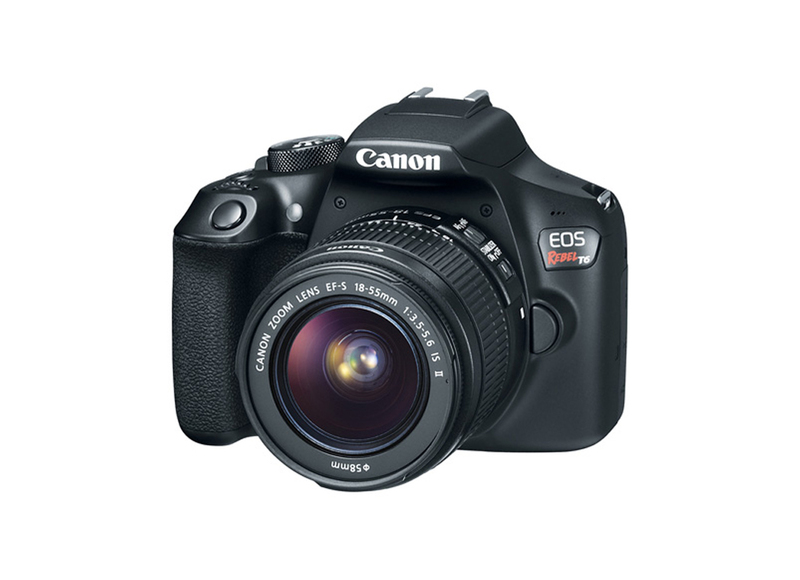 The Canon EOS Rebel T6 camera is also capable of taking 18MP high resolution photos consecutively for up to 6 raw frames or 3pfs. It has a predictive autofocus that helps keep your images clear and sharp even when shooting moving objects. You can also use the camera to shoot full High Definition 1080p videos at 30 frames per second. With the Canon EOS Rebel T6, your focusing accuracy in low and mixed-contrast lighting conditions is always enhanced due to the 9-point phase-detection AF which incorporates one cross-type point. The focusing system also uses an Al Servo Auto-Focus system for swift tracking and more perfect results. The auto intelligent scene mode is yet another great feature offered by the Rebel T6. This mode selects the cameras appropriate settings intelligently depending on different scenes thus enabling for more accurate exposures. The Rebel T6 also has integrated Wi-Fi connectivity with NFC which allows you to pair the camera with your tablet or smartphone thus making it possible for you to share your movies and photos wirelessly. This is a great addition as it means you can share your photos instantly from anywhere. The Wi-Fi connectivity is compatible with Canon Connect Station CS100 which is an optional storage device. 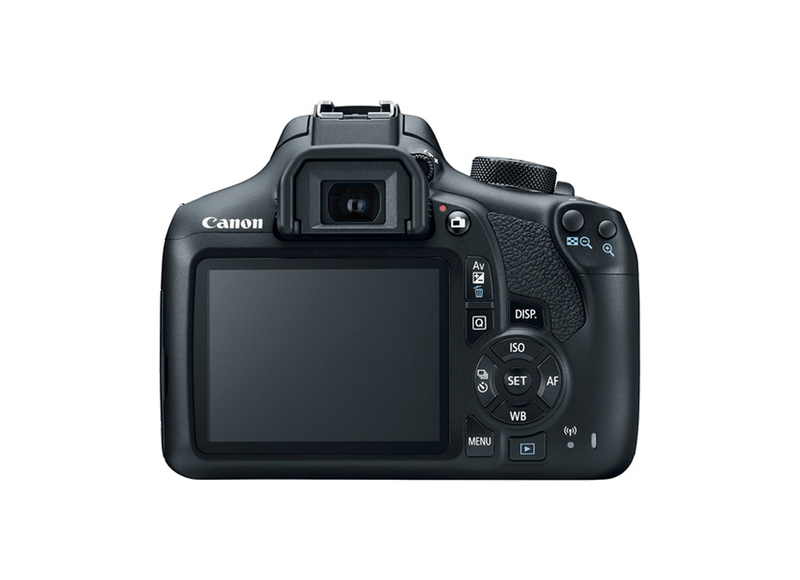 Also included in the body of the Canon EOS Rebel T6 camera is a single spherical element that helps control spherical angles and contribute to greater clarity. Additionally, it has an Optical Image Stabilizer which helps minimize the appearance of any camera shakes for greater handheld shooting quality. The is III lens has a specification of EF-S 18.55 mm F/3.5-5.6 and offers an equivalent focal length range of 28.8-88mm which covers short telephoto to macro to wide-angle perspectives. Not a bad camera for the price. The features and specs of the Canon EOS Rebel T6 offer you a lot to look forward to when shooting and recording your videos. It is worth trying especially if you are honing your teenager’s photography skills. 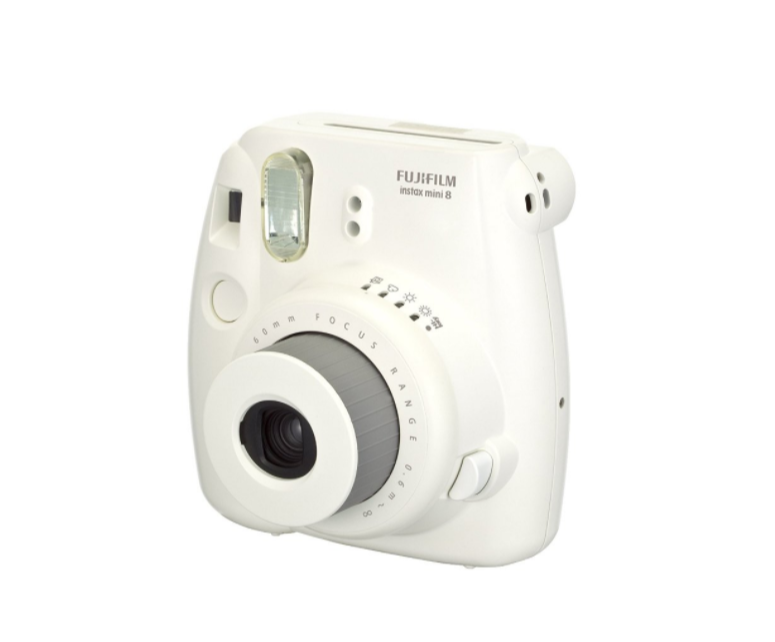 The Fujifilm Instax mini 8 is a retro-styled analogue camera that takes instant photos. By instant photos we mean photos that are printed immediately after taking one, straight from the camera. Being an analogue camera means this camera has no digital sensor to record the photo, and instead uses film, just like the old Polaroid cameras. The body is all-plastic, a bit chunky, but with nice vintage feel. It comes in five different colors, among them white, blue, pink, yellow and black. Even though it’s a bit chunky in size, it is nonetheless low in weight, around 307g. The camera is powered by two AA batteries and has a decent lifetime once the batteries are fully charged. This camera is as straightforward as it gets. It has only the bare minimum for controls, not that it needs more than that. You get a Power button which turns the camera on and extrudes the collapsible lens. Around the lens is a wheel used to choose between five different exposures for adjusting brightness. There is Indoors, Night, Cloudy, Slightly cloudy, Sunny and Bright. New from the previous model, we now have an extra exposure settings called Hi-Key for taking photos with extreme brightness for that special effect. The aperture sizes are fixed based on exposure settings and range from F12.7 – F32. To the top right of the lens is a always-on Flash. It’s strong and makes taking photos in low light a piece of cake. The only issue is that it sometimes makes color look a bit washed up. That leaves us with a shutter release button. Pressing it captures and prints the photo. On the rear, we have a viewfinder and that is it. The only real issue with this camera is the lack of autofocus and a limited range of its fixed focus. You can expect subjects which are within 0.7m to 2.7m to be in focus, but outside of that, things tend to get blurry. The film for this camera is relatively expensive, especially if you take a lot of photos all the time. If this is your primary camera than it can become an expensive hobby. But its not without its rewards. There is something special about being able to print your photos on-the-go and not store them on hard drive. This is especially interesting for children, as they can feel they produced something substantial, a physical photograph, and not just pixels on a screen. For those tweens and teens who are a bit more enthusiastic about photography, traditional entry-level P&S cameras might not cut it. If your focus is image quality, but find DSLRs too bulky and complex, a Mirrorless CSC (Compact System Camera) from Canon might be the perfect choice. 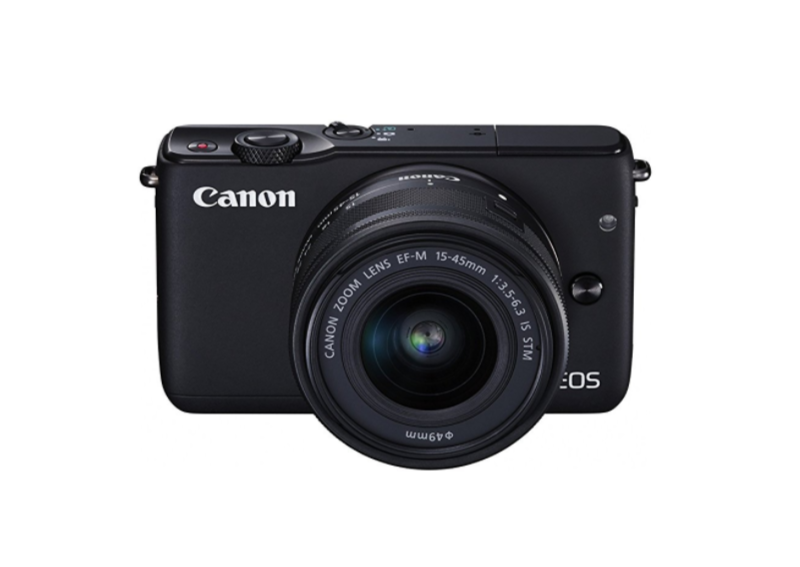 The Canon EOS M10 is a like a cross-breed of a Point-and-Shoot camera and a DSLR. It has a small, compact body built around a DSLR-type APS-C sensor, thus being able to produce high quality images without the usual hassle associated with DSLRs. Build quality of the EOS M10 is what we have come to expect from this class of compact cameras. It's plastic but it feels nice and sturdy. It is not waterproof though, so bare than in mind. The design is heavily focused on simplicity of use. There are no manual mode dials such as those found on advanced mirrorless or DSLR cameras. The top plate is populated by a dedicated shutter button and a video recording button. Next to it there is also a small dial with three options, two of which are for shooting stills while the third one takes you into Movie mode. Still photo modes are divided between the fully automatic Scene Intelligent Auto mode and a Creative (manual) mode. Switching to the Creative mode reveals all the usual DSLR-style settings, such as Shutter and Aperture Priority, hidden within the on-screen menus. The rear of the camera is equally uncrowded, with most of the space taken by an impressive 3-inch 1.04m-dot tilt-able LCD screen. The screen is able to tilt upwards by 180-degrees which is perfect for selfies, which is in turn an especially attractive feature for teens. To the right of the screen there is a standard four-way navigation pad with double functionality for quick settings such as Flash and Exposure. Sitting just beneath there is a dedicated media button. The Canon EOS M10 is still an ILC (Interchangeable Lens Camera), but the lenses built for this camera are much more compact than those used by Canon DSLRs. For example, M10's kit (in-package) lens is surprisingly small and light, while offering 15 – 45mm focal length (24 – 72mm in 35mm film terms) which quite versatile. In fact, most people will probably be perfectly fine with using this lens only as it provides a good focal range for landscape, portrait and street photography. 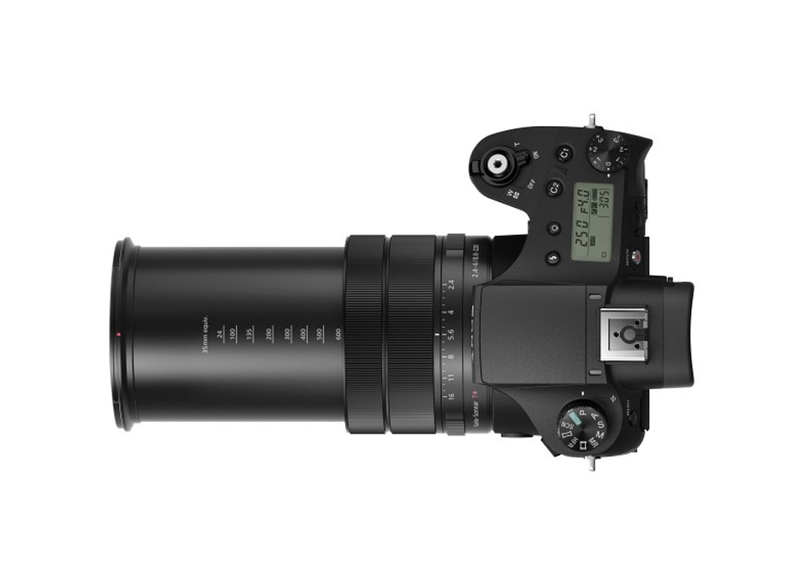 The lens is particularly fast – it comes with rather standard entry-level aperture of f/3.5 - 6.3, but it does include optical image stabilization which will compensate camera hand shake, allowing you to use slower shutter speeds and ultimately enabling you to use it effectively during night too. With a 18 MP APS-C CMOS sensor, you can expect about the same image quality found in low and mid-range Canon DSLRs. This sensor will produce fairly sharp JPEGs and provide respectable noise handling. The ISO range is from ISO100 – ISO12800, expandable to IS025600. Images captured at ISO1600 or lower will show no noise, while at ISO3200 noise does appear but is not significantly destructive. ISO6400 still shows relatively good results, with ISO12800 still being usable for web sharing and small prints, with appropriate noise reduction in post-processing. We recommend avoiding ISO25600 altogether as at this point noise is simply too much and the details are lost during noise-reduction, be it in-camera or in post-processing. The built-in Flash generally performs well, with decent lighting power and smart red-eye removal algorithms. Video is available in several settings, with a maximum resolution of 1080p Full HD at 30FPS. The M10 isn’t particularly fast for a Mirrorless camera, but the DIGIC 6 processor will provide for a 4.57 FPS (frames per second) in JPEG continuous shooting mode, and 4.4FPS in RAW + JPEG mode. Connectivity-wise, the EOS M10 comes with built-in Wi-Fi and NFC for quick and easy photo sharing, as well as remote camera control. The Canon EOS M10 Mirrorless Camera offers a lot for a not-too-expensive price tag. It offers excellent image quality and the ability to shoot decent photos in low light. It has a very sharp and versatile LCD screen which can be fully rotated for easy selfie capture. Performance, build quality and connectivity don’t really have an edge against the competition, but are all nonetheless solid options. Perhaps the strongest area of this compact camera is its lens, which are considerably reduced in size and weight without compromising quality or performance. All in all, you get a very capable camera which can go against serious DSLRs in some areas in a smaller, lighter and simpler package. This might be just the perfect camera for a teen child with a more enthusiast interest in photography. We hope you have found this guide to be useful, and see you next time! These are the criteria we take into review when recommending a camera. – When talking about kids cameras, the design is especially important. Kids like colorful, attractive designs. Some kid cameras look like toys, which works great for very young children. Design is more than looks, so kids cameras need to be simple to use and easy to grip as well. Price/Product rate – When investing in a camera which will be used by children, we must be careful not to buy them something too expensive, as they might easily brake or lose the camera. That is unless we are talking about an older child which is relatively responsible with their favorite shooters. Another exception are rugged, durable cameras which can survive anything a child throws at it. Weight – Again, we are reviewing kids cameras and kids are generally not very strong. We avoid cameras that are too heavy and too bulky at all costs. Waterproof capabilities – Kids love water and what is more fun for a child that likes taking photos than to take photos underwater? We’ve selected several rugged waterproof cameras for your child, be it for protection against accidental drops into water or splashes, or to dive it into the sea or a pool. 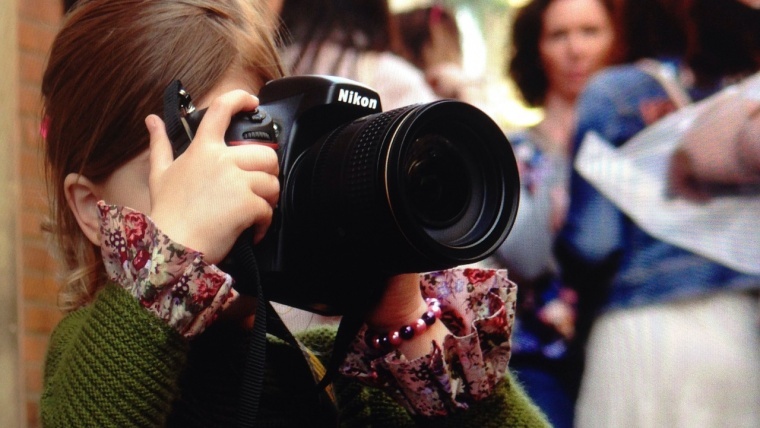 Grip – We have been extra careful to choose cameras with a good grip that is not too large for children. Kids are clumsy and its important for a kid camera to have a good grip, both to ensure they don’t drop the camera and to make it easier for them to take crisp photos without motion blur. Image Quality – Image quality is generally one of the major concerns when buying any camera. We’ve made sure to list a few cameras that provide excellent image quality, though these are intended for older children with a more serious interest in photography. Adaptability – Kid cameras are generally rugged, so they don’t need some of the extra accessories like waterproof casing. However, if you’re buying an ILC (interchangeable lens cameras) for say, your teen child, it’s important that camera has a wide selection of available lens to choose from. Same goes for other accessories, like additional straps, lens filters, tripods, protective cases, additional battery grips, external lighting and so on. That’s why we only choose to recommend brands and models that are still active in production and have wide support, be it first or third-party equipment. Ease of Use – Ease of use depends on the type of the camera. A simple point-and-shoot camera will be a lot easier to use than say, a DSLR. Still, even when it comes to advanced cameras we’ve chosen cameras that are intuitively designed and beginner-friendly. Availability – Everything we list and review here is checked for availability. We don’t recommend cameras that are unavailable as new products or are completely out of production. I have a small child and would like a camera that is both a fun toy and a real camera. Is there such a thing? There sure is! Take a look at the Vtech Kidizoom Spin and Smile. It has dual cameras, built-in games, a colorful and a robust body and lots of other cool features! I need a simple point-and-shoot camera for my kid that is also very durable. What is the best option? The obvious choice here is the Nikon Coolpix S31. It is very easy to use, offers basic imaging capabilities with a few added perks and is very durable. It’s also a rugged, water-proof camera, perfect for summer vacations or winter ski trips. I am looking for a camera that shoots underwater. What are my options? You have two options here, that is the Nikon Coolpix S31 and Ricoh WG-50. If you are on a budget and what a simple all-around camera, the S31 is a good option. 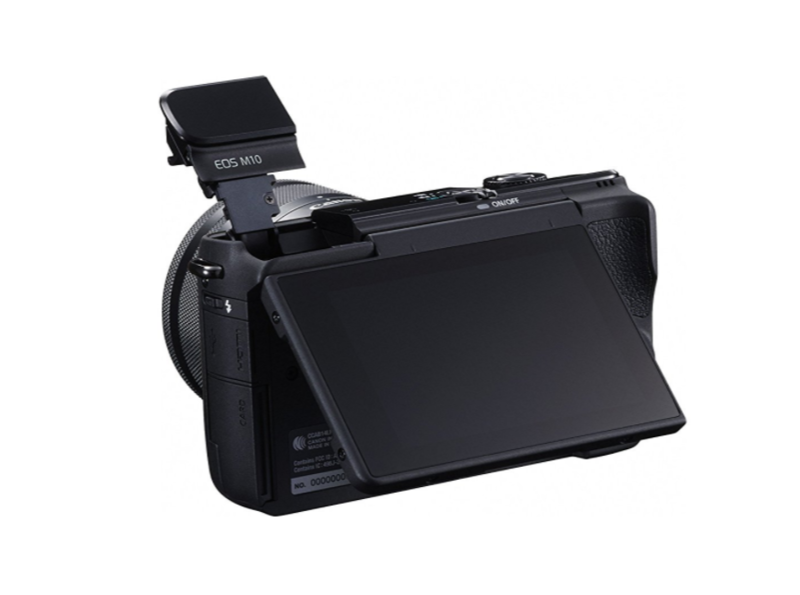 But if you want a bit more flexibility with the maximum depth and shooting parameters, and are ready to chip in a bit more money, than go for the Ricoh WG-50. I have an older child with a more enthusiast interest in photography, I want a camera that will enable him or her more control over the camera. For this, you should consider Canon EOS M10 or the Canon EOS Rebel T6. The M10 is a compact system Mirrorless camera that is extremely simple to use and has very little manual physical controls. It does, however, feature a Creative Mode which will provide plenty of on-screen manual controls such as Aperture, Shutter Speed, ISO, etc. I want the Polaroid-style camera that can print photos as they are taken. What do you recommend? 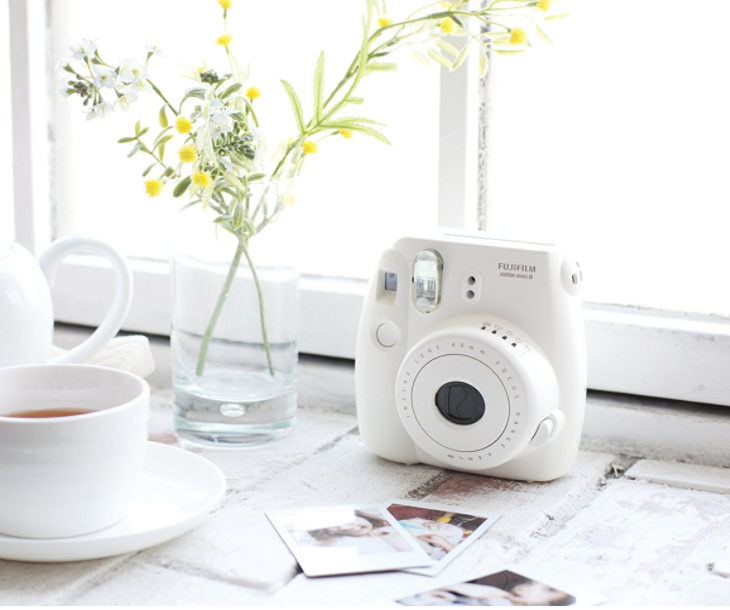 Fujifilm Instax mini 8 is a film-based camera that is extremely simple to use and is able to print retro-styled photos on-the-go. What is the best-rugged camera on this list? One that is resistant to shock, dust, water and freeze? If you want the best possible durability you should consider the Ricoh WG-5.